On July 14, 2010, a week after suing the state of Arizona over S.B. 1070 for “interfering” with the enforcement of federal immigration law, the Obama Administration said it would not sue sanctuary cities that defiantly refuse to cooperate with enforcing federal immigration law. 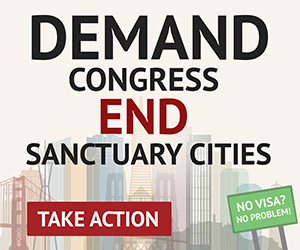 Cities with sanctuary policies impede the ability of federal authorities to enforce immigration law, such as by barring local police from asking suspects about their immigration status, even though the Illegal Immigration Reform and Immigrant Responsibility Act of 1996 expressly prohibits state and local governments from doing so. In subsequent years, Rep. Smith’s statement proved prescient as the Administration continued to sue those states that passed laws meant to discourage illegal immigration, and ignore those that flouted the enforcement of the nation’s immigration laws. Unfortunately, individual citizens themselves are generally not able to establish the standing to sue their local officials for violations of federal law such as those involved in sanctuary policies. Therefore, the Administration’s refusal to sue states and localities for their illegal sanctuary policies has meant that they have been able to ignore the law with impunity. Next Article Could the Mainstream Media Be Waking Up? Foreigners entering the United States without authorized documentation are not “immigrants.” They are aliens, and remain aliens, and are in violation of the law besides. In order to deal with the enormous number of illegals presently congregating on this side of the border, the US Government might consider chartering trains (this time regular passenger trains), and pay Mexico to have preference on the rail right of way for, say, about 6 months, during which a few trains could be run daily. Sending out such a huge alien population by air will be much more costly, and guess who’s going to pay the bill! Everyone loves to reference Obama’s “Amnesty”. Does anyone have anything to say about Ronald Reagan’s “Amnesty” ? I’ll take a wild stab at that one. Reagan’s was passed by both houses of congress and signed into law. Uh… Obama’s is what HE wants, with NO respect to what the American public wants. Once again… Obama knows what’s best for us, since we’re too stupid to figure it all out. That’s what government’s for, right? 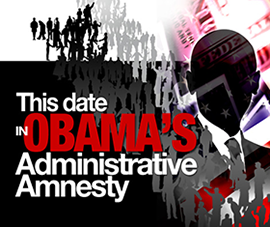 Reagan made a big mistake granting amnesty. He was promised by the Democrats (TIP O”NEil ) That they would secure the border after he signed the amnesty bill. Needless to say the promise to secure the border was not kept and that is why WE MUST SECURE THE BORDER FIRST THIS TIME. Impose stiff penalties for all employers who hire (knowingly or not) illegals – including families who hire illegal maids, babysitters, gardeners, et al. Eliminate the myriad of benefits that illegals receive. End the sham of ‘anchor babies’ with their corresponding chain migration effects. If these measures are genuinely accomplished, then the border will essentially secure itself. It’s also important to keep in mind that many more illegals are here due to overstayed/expired visas than by actual border crossings. Sadly, our current Congress does not have the courage or political will to adhere to these common sense measures. Congress? Your president has actually sued states to keep them from enforcing existing federal law, while ignoring cities that refuse to enforce federal law. Congress has become the bastion of the feeble minded power elite who care only about remaining in office. They have the “reverse Midas touch” in that everything they touch turns to crap. The only way we can save this country is to vote everyone of those douche bags out of office. Our founding fathers never envisioned career politicians, with their millions of dollars in campaign war chests; citizens were to serve then return to private life. Any elected official who swears an oath to support and defend the constitution and the publicly states that it is a deeply flawed document should be subject to a recall vote by their constituency or impeached immedeatly.